Padauk is a Unicode-based font family with broad support for writing systems that use the Myanmar script. 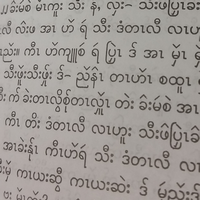 The Myanmar script is used to write over 27 languages in Myanmar. Padauk supports a full range of these writing systems. 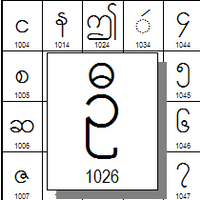 See the complete list of Myanmar writing systems on ScriptSource. The fonts use state-of-the-art OpenType and Graphite font technologies to provide accurate typography, with correctly positioned combining marks, properly formed clusters and conjuncts, and a wealth of alternate forms and variant glyphs. Read more about our smart font features. Four weights are provided in this font package (Regular, Bold, Book and Book Bold). Read more about the design. 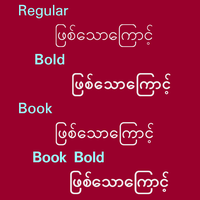 Padauk includes full support for Unicode 9.0 Myanmar ranges. Read more about our character set support. What platforms and software will Padauk work in? Padauk will work on Mac OS X, Linux and Windows. However, keep in mind that the later versions (such as Mac OS x v10.8+ and Windows 7+) give the best support. The other key to successful rendering of complex fonts is the support given by the application you are using. What is so special about Padauk? This font is designed to work with two advanced font technologies, Graphite and OpenType. To take advantage of the advanced typographic capabilities of this font, you must be using applications that provide an adequate level of support for Graphite or OpenType. These advanced capabilities provide the logic for complex rendering of the Myanmar script. The Graphite supports also allows access to the variant character forms used in many languages. Can I make a web page using this font? Yes. You can create web pages that request that Padauk be used to display them. In the download package we provide a WOFF font. See Using SIL Fonts on Web Pages for instructions on using fonts on web pages.